At the February 2013 board meeting, Grace Ministries International adopted its 10-year ministry plan. It is the blueprint to realize our vision of what GMI will look like by 2023. We are not content with preserving what we have, but we want to grow and extend our reach so the gospel is preached, churches are planted, leaders are raised, and communities are changed in even more areas around the world. The following are three of the main goals for Vision 2023. Vision 2023: How are we doing?Accomplishing this goal will nearly double the number of GMI fields by 2023. Many of our missionaries and national churches in our existing fields already have contacts in neighboring countries. We want to be intentional about pursuing these contacts while at the same time surveying potential new fields where the gospel needs to be preached and where healthy churches could be planted.  The ultimate goal–and an important measure of success–is our intentional effort to partner with national believers in these new fields, to plan and dream about ministries in their countries resulting in the release of these ministries to self-sufficient and self-propagating national churches. In order to achieve this kind of geographical growth and expansion we need more workers. 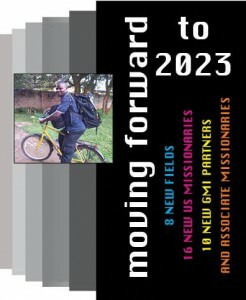 By 2023 we are praying for and seeking 16 new U.S.-based missionary families or individuals. The GMI missionaries currently serving on the field are a very talented and dedicated group with an incredible wealth of experience. We are excited about the prospect of having new missionaries work with this seasoned team as we look to reach out into new fields. In reality we are not just looking for 16 new missionaries, but 16 missionaries who will disciple others and release ministries, leaving a legacy that is not primarily buildings and programs but a legacy of national leaders who are multiplying themselves through investing in yet others. The world of missions is changing. We recognize that we can be even more effective in reaching the world by creating a missionary team that looks more like the world we are trying to reach. The modern missions movement is many generations old and because of this we are seeing exactly what we should; men and women from around the world indwelled by the Holy Spirit and saying that they too want to serve the Lord on a mission field. They are ready to leave their country of origin to reach out to others and to share the riches and spiritual blessings they have received through having believed the gospel. GMI is seeking the workers needed to grow and expand through partnering with these national believers who want to go and serve in parts of the world that look and think much as they do. GMI is seeking the workers needed to grow and expand through partnering with these national believers who want to go and serve as missionaries with their indispensable cultural perspectives and unique ministry experiences. Vision 2023: How are we doing?